Playa Blanca: Once a small fishing village near the most southerly tip of Lanzarote; in recent years Playa Blanca has developed into a popular resort. Marina Rubicon: A recent development in Playa Blanca is the Marina Rubicon. Located at the eastern-end of the resort, Marina Rubicon is a sea-front development of upmarket restaurants and designer boutiques positioned next to a beautiful Marina of luxury yachts and boats. Here at the water's edge you can sit back and sample either the local or international cuisine that is on offer. Lanzarote Beaches: Lanzarote has a large variety of wonderful beaches. From the beautiful bleached white sands of the North to the golden sands of Puerto Del Carmen to the black sand at Playa Quemada, you will be amazed at this contrast that is unique to Lanzarote. Playa Blanca: In the South of the Island near the resort of Playa Blanca lie the most beautiful beaches of all - Papagayo. These fantastic golden sand beaches are a must for beach lovers. Also in Playa Blanca are the two man-mad beaches of Playa Dorada (with beach-bars, pedalos, banana boats etc) and Playa Flamingo. The small but attractive beach in the centre of Playa Blanca town is also popular - especially during July and August. Eating Out: There is no shortage of places to eat. The seafront at the centre of town is literally lined with restaurants catering to just about every taste and nationality imaginable. 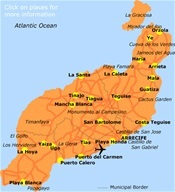 If you feel up to it you can even take the ferry to the neighbouring island of Fuerteventura. The trip takes just twenty minutes and is a fabulous excursion. Sports & Leisure: In the main, sporting activities tend to be related to the sea, Lanzarote is perfect for windsurfing, swimming, diving, surfing and fishing.